8 Inch Size I - SHIPS FREE! 8 Inch Size II - SHIPS FREE! 8 Inch Size III - SHIPS FREE! 8 Inch Size IV - SHIPS FREE! 8 Inch Size V - SHIPS FREE! 8 Inch Size VI - SHIPS FREE! 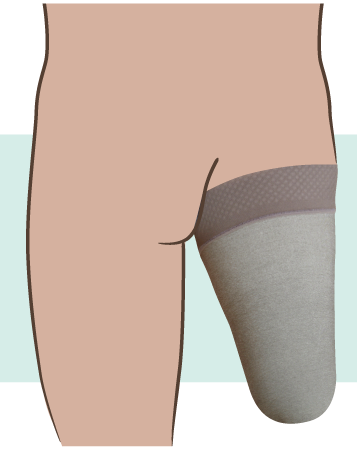 Stump Shrinkers, manufactured by Juzo, are compression garments designed to maintain the shape of the stump through mild to moderate compression. These Stump Shrinker Socks are designed for those with above the knee amputations. Unlike some other Amputee Stump Shrinkers, these compression socks feature a soft, Varin material and non-irritating, lay-flat seams. This material helps to reduce the occurrence of pressure sores. Juzo Silver Stump Shrinkers are compression stump shrinkers that contain x-static silver threads. This silver is anti-microbial, so that it effectively reduces the risk of infection. Silver also reduces any odors that may occur, making these stump shrinkers easy to wear all day. These fabrics are hypoallergenic and latex free, so that they suit the needs of almost anyone with a below the knee amputation.